It's been a min since i last blogged, i hope everyone's well. 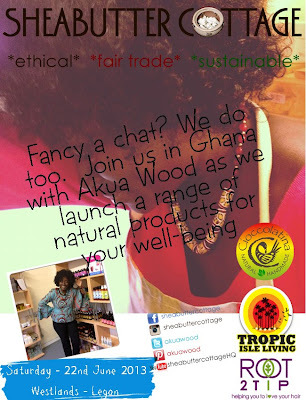 So I am happy to announce to you the first SANKOFA Meetup being organized by Akua Wood of Sheabutter Cottage, an online UK retailer of natural hair and skin care products. SANKOFA is basically is a meetup to mostly chat on hair and skin care as well as sales of hair and skin care products. It comes off on the 22nd of June, 2013 at Legon Westlands from 2 pm to 8 pm. It's a free event and there is going to be free food and swag bags To book your free ticket kindly click this link. As at the time of writing this post, there are just 16 tickets left, so avoid disappointments and grab a ticket now, it's free. So Sheabutter Cottage is an online retail shop of natural and mostly handmade hair and skin care products with most of their products made with natural resources from Ghana and this event will see the launch of their product range in Ghana. What i like most about this company is the fact that its a fair trade company and they do well to give back to the community that they get their raw resources from. They have several projects on-going in Ghana so i really will not mind purchasing from this company because in the long run, they will give back. Akua Wood, CEO of Sheabutter Cottage, is also well versed in natural hair and skin care remedy so be sure to come along with all the questions you might have. I am really looking forward to this meetup and to purchase some products esp, for skin care that i will usually not get hold of in Ghana. This event is for everyone, natural haired, transitioning or relaxed, everyone looking to improve their skin care, can benefit from this. So be sure to come with loads of cash and buy some products too. So the countdown is on, register now and tell a friend too. See you there. P.S. For more information on this event kindly contact Akua Wood via facebook at Sheabutter Cottage or tweet her at her personal twitter https://twitter.com/akuawood she responds promptly.